John Stuart Mill's On Liberty is widely regarded as one of the most influential and stirring pieces of political philosophy ever written. Ever relevant in our increasingly surveillance dominated culture, the statements made argue strongly in favour of the rights of the individual, privacy and freedom of expression. 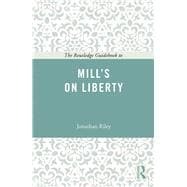 The Routledge Guidebook to Mill's On Liberty introduces the major themes in Mill's great book and aids the reader in understanding this key work, covering:The context of Mill's work and the background to his writingEach separate part of the text in relation to its goals, meanings and impactThe reception the book received when first seen by the worldThe relevance of Mill's work to modern philosophyWith further reading included for each chapter, this text is essential reading for all students of philosophy and political theory, and all those wishing to get to grips with this classic work of political philosophy.